When you think about Easter, what comes to mind first? Surely not human-sized bunnies — at least we hope not. Not, for candy lovers Easter is heaven. Some of Earth’s greatest candies come into season for Easter: jelly beans, Cadbury Creme Eggs, and pure chocolate bunnies rank among many of our favorite treats. And yes, for those who enjoy them, marshmallow Peeps also come into season. 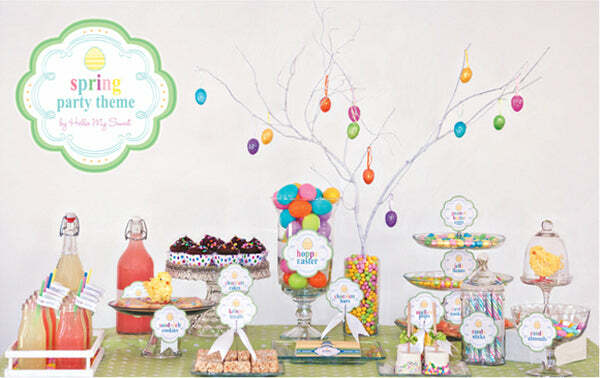 With so many great candies readily available, you can make some creative candy buffets for an Easter get together. Need some ideas that the kids of the family — and the adults as well — will love? 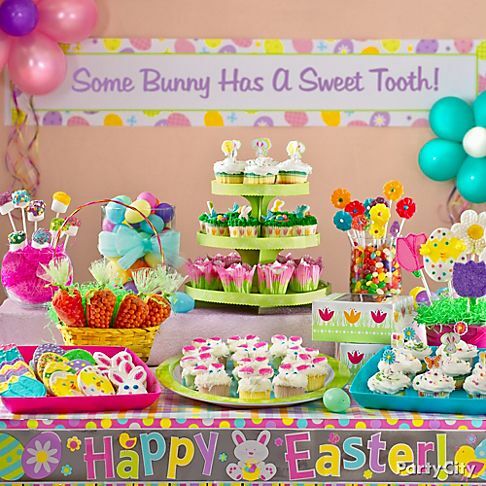 We’ve rounded up 11 of the very best Easter candy buffets so you can get some ideas. 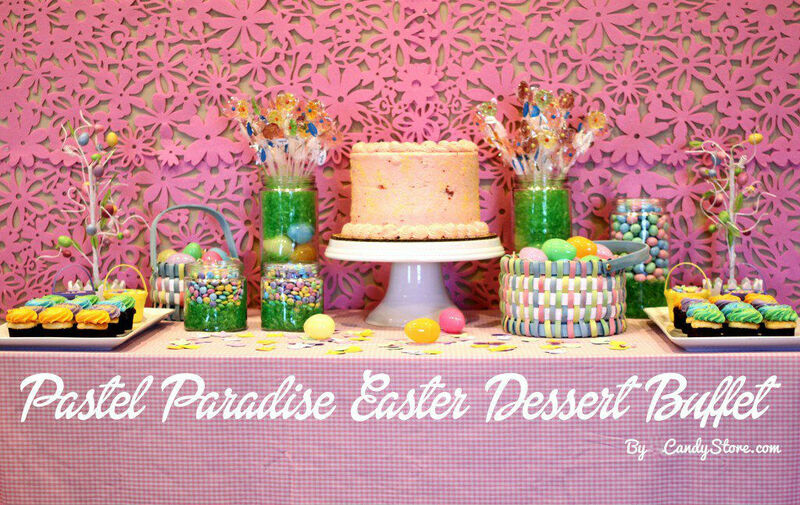 What better way to kick off this post than with our own Pastel Paradise Easter Dessert Buffet? 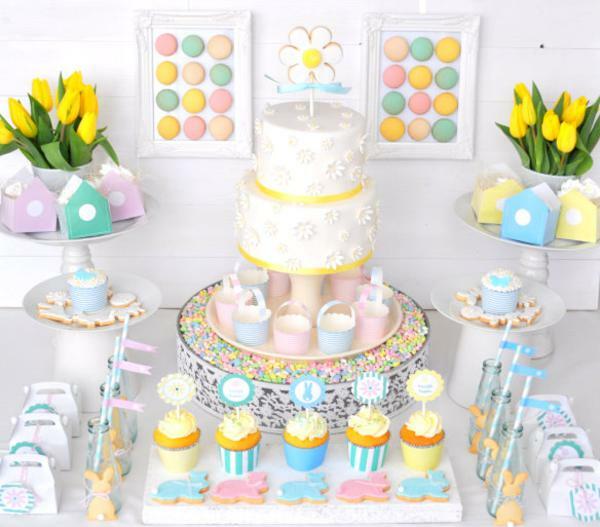 Created last year for this very holiday, we tried to fit as many pastel-themed Easter candies into this dessert table as possible. Although we knew our crowd, so the cake and cupcakes were the focal points of the display. Oh, and since we had trouble finding pastel-colored jelly beans, we simply put them inside the plastic eggs. Crafty, eh? One thing we love about this table is how a part of the decor, the tree, is incorporated into the candy itself. Although, it might be difficult to fish the candies out of your lovely candy buffet containers that are actually holding up the tree(s). What we love most, though, is the printable labels on this one. You can certainly get creative, with elaborate fonts and pastel colors on your labels. So make sure to put as much thought into the labels as you do the buffet contents. If you want some pastel inspiration, this one will do you well. 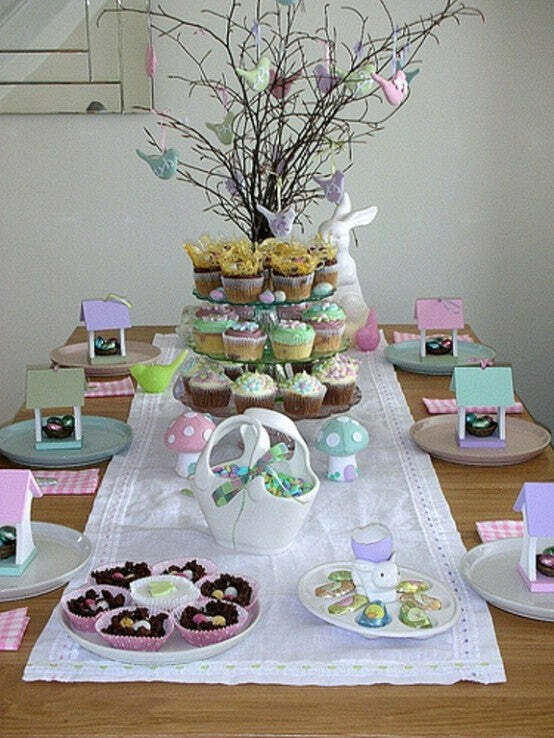 That cookie tree to the left is just one of the neatest things we’ve seen in a dessert table. Anyone who can color coordinate half this well is already doing a great job, so study this picture as you’re creating your Easter candy buffet. There are tons of design lessons in it. It’s hard to go wrong with a cake centerpiece in a dessert table. There are a few interesting elements of this, including the flowers in the back row. They add a little vibrancy to the whole display, don’t you think? This one is also big on containers, which is certainly something you need to think about when creating a candy buffet. Will plates work? Or do you need another way for people to gather and transport the candy? Sugar sugar everywhere! 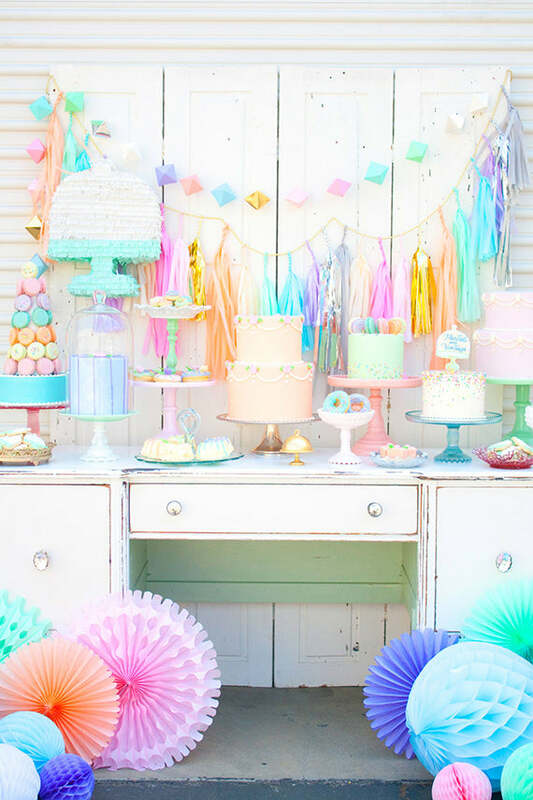 This dessert table is absolutely packed with candy and cupcakes, all with impeccable design. Look at those cookies! You can tell that someone with a keen eye for detail put together this display. We’d really like to get our hands on those carrot-shaped bags of what appear to be Reese’s Pieces. They should be part of any Easter dessert display. This display starts with those pastel eggs in cups at the front. What a neat little concept. Everything on this table appears very sleek, which is an interesting juxtaposition with the rustic scenery. If you want to add some out of the box visual elements to your dessert table, make sure to pay attention to how this one is put together. Not every dessert table has to be assembled so that people walk by, pick up what they want, and go sit somewhere else. A dessert table can be exactly that: a display of dessert on a table that everyone’s sitting at. If you’d like to keep everyone together at the table, be sure to take notes on this display. 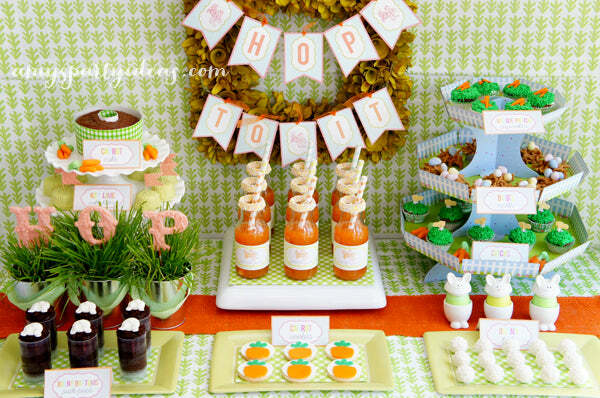 If carrots is the theme you’re going for with your dessert table, check out this display. The only thing it’s missing is the carrot-shaped Reese’s Pieces bags. But everything else? Carrot-shaped candies, carrot-themed cupcakes, carrot juice — even the potted plants look like they’d be carrots if you uprooted them. If this dessert table proves nothing else, it’s that background matters. Of course, the bright blue frosted cake helps. One reason we love this one: the inclusion of Cadbury Creme Eggs. They’re not exactly the most buffet-friendly candies, but Anders Ruff has done a remarkable job making them work. Disclaimer about this one: you will absolutely have to click through to Party Pinching to get a real sense of what goes into this display. The full picture doesn’t truly capture the detail and work that goes into it. 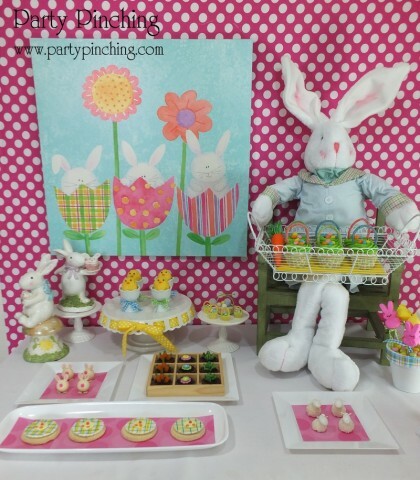 For instance, the tray that the bunny is holding? Yeah, there’s work that goes into that element. 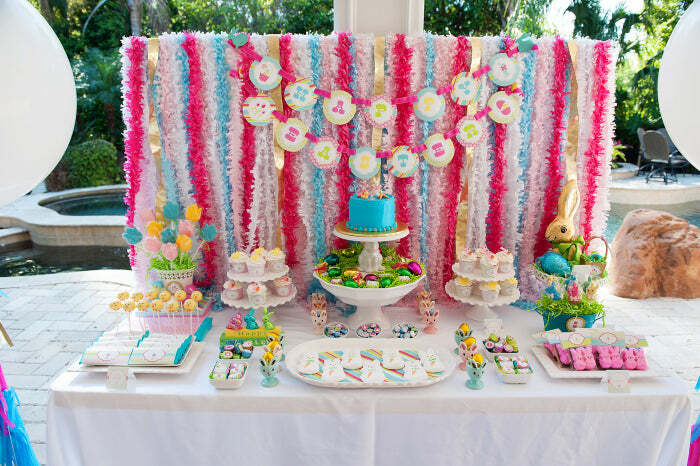 This is just a perfect dessert table for a small gathering of mostly children. 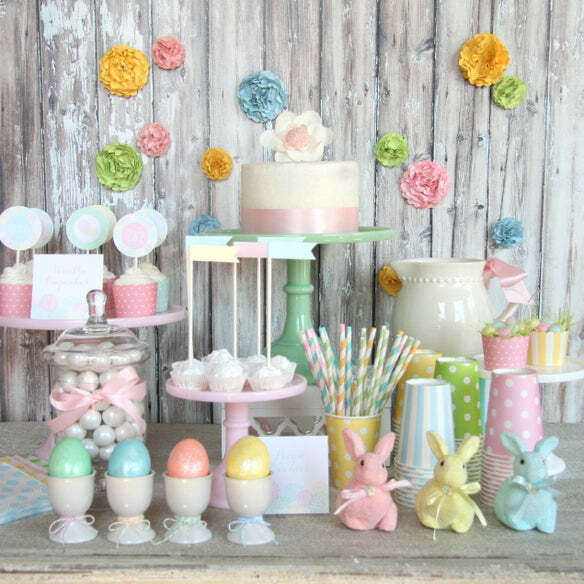 Want to create a breathtaking Easter dessert table, but don’t want to spend a fortune doing it? 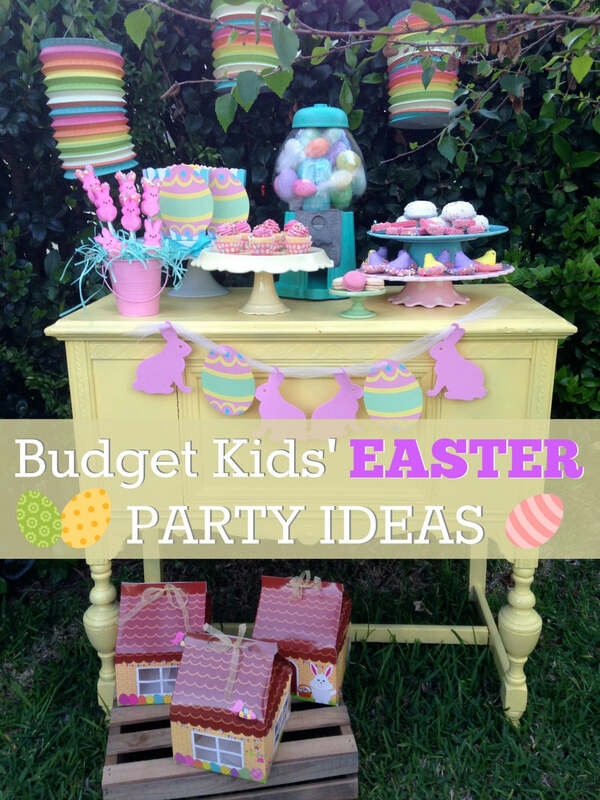 You absolutely could spend yourself into debt creating some of these displays, but Catch My Party has some creative ideas to keep your budget reasonable. As you can see from the displays he created, a budget buffet doesn’t have to be a flimsy looking one. Hi Jennifer, sounds great. I’ll shoot you an email.